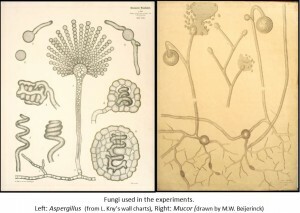 In April, I published a survey of the currently accepted authentic Van Leeuwenhoek microscopes in FEMS Microbiology Letters, and suggested that more might be found. Within a month, there came news of two previously unknown microscopes. Their history over the intervening centuries could not have been more different. 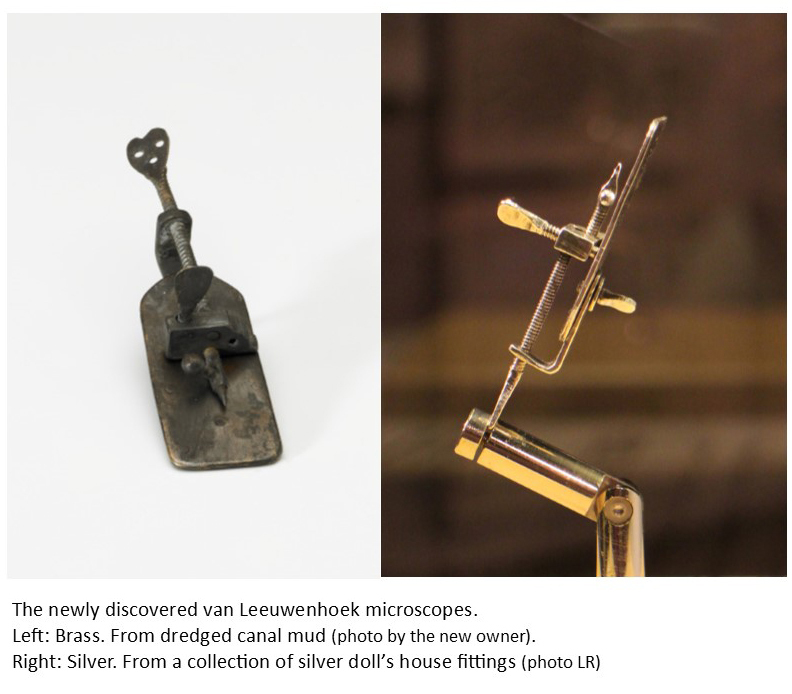 Press releases in the Dutch newspapers and on TV (21st May, 2015) announced that a silver Van Leeuwenhoek microscope had been discovered in a box of old Dutch doll’s house equipment. The new owner took it to the Museum Boerhaave in Leiden for authentication. 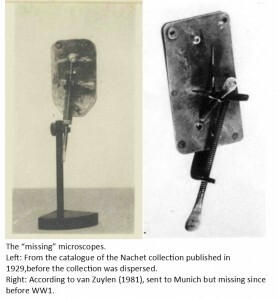 They compared it with the 4 Van Leeuwenhoek microscopes already in their collection and the microscope belonging to the University of Utrecht before presenting their results at the beginning of June. They concluded that this microscope indeed dates from Van Leeuwenhoek’s lifetime and must be considered to be authentic. It can be seen at Museum Boerhaave until mid-July (2015). Thereafter it will go home to its owner for display at Planetarium Zuylenburgh in Oud-Zuilen. Within days of the announcements about the silver microscope, a letter by Brian Ford appeared in the journal “Nature” (28 May, 2015), announcing the finding of a brass Van Leeuwenhoek microscope in sediment that had been dredged from Delft canals during maintenance work. This microscope’s new owner had sent it for authentication to Dr Ford in the UK, and he had concluded that it was indeed real. Before these two discoveries, the most recent find was in 1983, when a visitor to the “Beads of Glass” exhibition at Museum Boerhaave donated a small silver microscope that she had owned without realizing what it was. It is likely that many of Van Leeuwenhoek’s gold and silver microscopes have been melted down, but my crystal ball tells me that there must be more out there to find, especially since he also made a number from brass. For example, two microscopes were individually photographed at the start of the 20th century in Munich and Paris, but their locations are now unknown. From the photograph in the 1929 Nachet Collection Catalogue, it can be seen that the Paris microscope had been incorrectly assembled and could not have been used until it had been put together properly, a mistake that someone making a copy would be unlikely to make. The Munich microscope had been accepted as authentic by the University of Utrecht in the late 19th century, before it was sent to Munich. Like the newly discovered microscopes, there are structural similarities, but neither appears to be physically identical to the accepted microscopes. 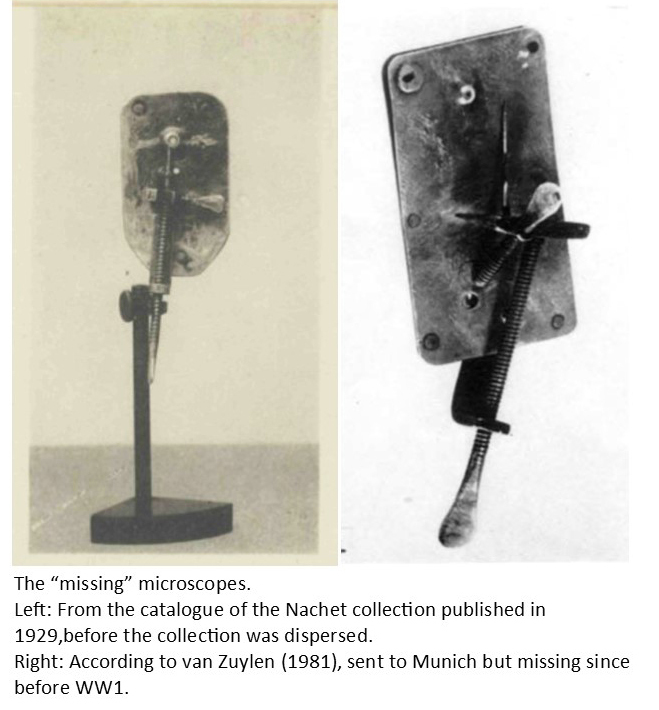 This rules out most of the known late 19th and 20th century copies (which tend to be replicas of either the Utrecht University microscope or one from the Museum Boerhaave collection). Hopefully they (and others) will reappear, and can undergo modern authentication analysis. With the increased interest in Comet 67P and ESA’s robot lander, Philae, this seems an opportune time to take a look at a small set of experiments carried out by Prof Beijerinck at the end of the 19th century. During the 1870s, there had been suggestions that life could have come to Earth from comets, but the discussion was largely theoretical until physicists found ways to replicate the temperatures found in space by liquefying gases. In April 1907, Professor Heike Kamerlingh Onnes of Leiden University gave a demonstration of his new equipment for producing liquid gases (especially hydrogen) at the 11th Congress of the Holland Society of Sciences in Leiden. Beijerinck had been a member since the foundation of the Society in 1888 and it’s hard to imagine that he missed a chance to tour Kamerlingh Onnes’ brand new laboratory. It’s surely not a coincidence that in November and December of that year, he and his assistant, C.J. Jacobsen, took microorganisms from their collection to Leiden in order to test their ability to survive such extreme cold. The experiments were very simple. They used a collection of microorganisms that they knew well, and whose behaviour under normal conditions they could predict. 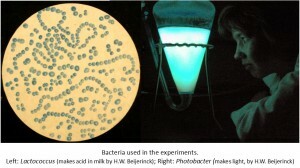 They chose bacteria that could make acid from milk and others that make their own light (bioluminescent), as well as cyanobacteria (also called blue-green algae). 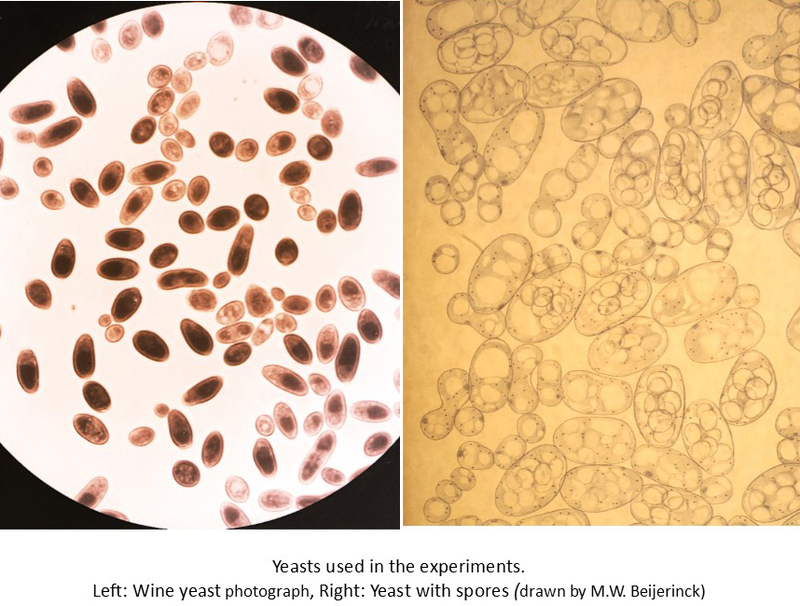 Among the “higher” microorganisms were yeasts that can make survival forms called spores, and others that can’t, as well as a couple of fungi which also make spores, and a green alga. Small amounts of each organism (in their growth medium) were sealed in small vials and then frozen in liquid nitrogen (N2; freezes at -195.8°C) or liquid hydrogen (H2; freezes at -253°C) for different lengths of time. The growth and behaviour of the microorganisms were then compared with cells that had not been frozen. The first experiments used liquid N2 (probably because it was easier to produce) for 15 minutes. The second series used liquid N2 for 10 hours or liquid H2 for 45 minutes. The third series involved liquid N2 for 3 and 11 days. Finally, the microorganisms that had survived best were compared in liquid N2 over periods up to 15 days. 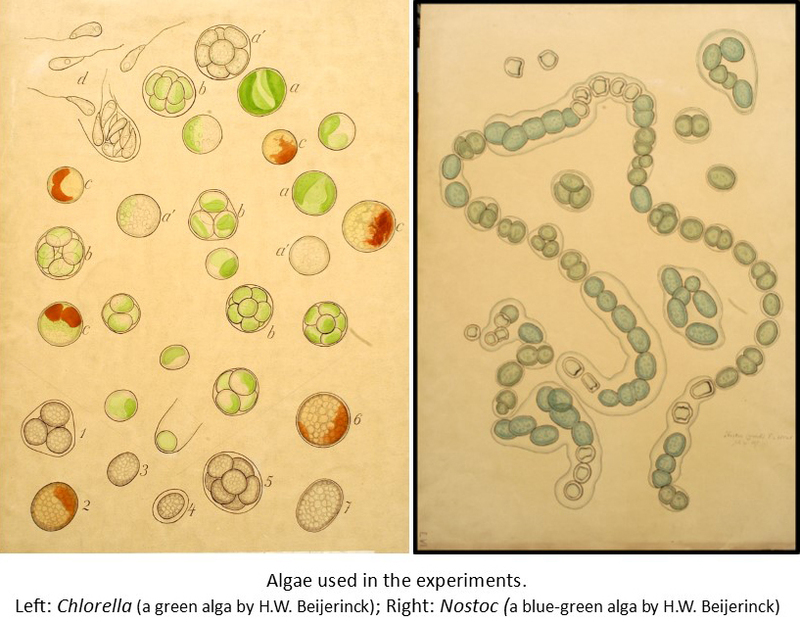 There was little difference between the N2 and H2 results – once the organisms were deep frozen, the extra drop in temperature made no obvious difference. The length of time frozen also made little difference. Survival varied with the microorganism involved. The spores of the fungi and yeast that could make them survived, but their active cells didn’t. The bacteria survived. 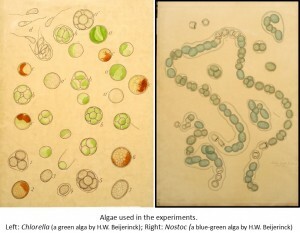 The cyanobacteria all died and the higher green alga survived. From these simple experiments, it could be concluded that simple microorganisms such as bacteria and organisms that make survival spores could survive in comets. Beijerinck also commented that extreme cold could not be used as a means of sterilisation. 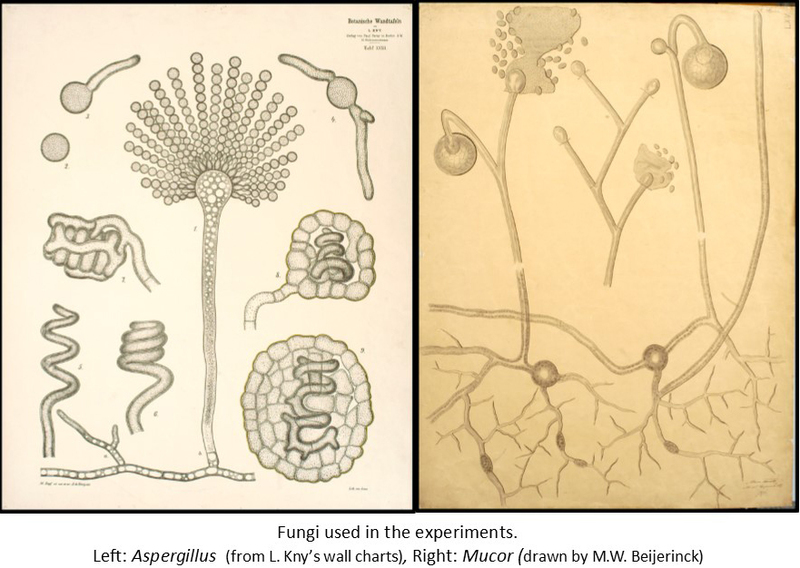 Deep-freezing microorganisms appears to have been a curiosity for Beijerinck and he does not seem to have returned to the subject. We now know that more complex cells can survive if they are suspended in a solution with suitable protection, and they also do better if they’re frozen and thawed correctly. 100 years after Beijerinck’s experiments, deep freezing (usually in liquid N2) is now used to safely store all sorts of biological material from research stocks of bacteria and viruses to human sperm and tissues.